Web Programmers and Marketers and Bloggers alike are very much familiar with the concept of Search Engine Optimisation. SEO has become so integral to web development that it can no longer be truly considered the domain of ONLY copywriters. In fact, web development companies like HireIndianProgrammers have the mandate of hiring programmers having holistic knowledge of everything in web development. 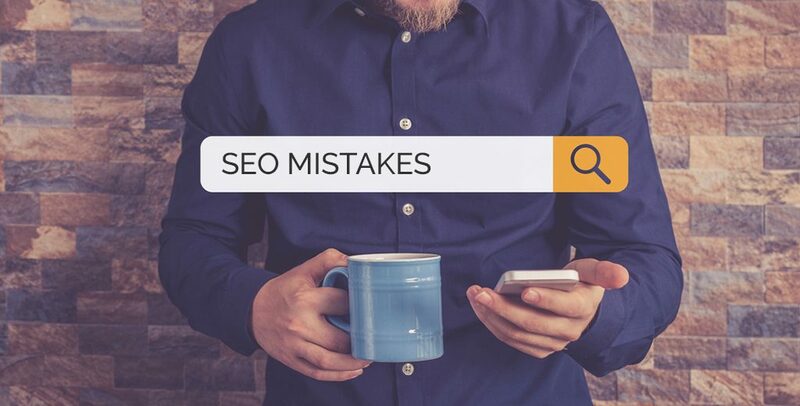 In this blogpost, our programmers will delve into some of the common SEO mistakes and also suggest measures to overcome the same. All of these errors can be fixed with modifications to web design. Responsiveness and positioning of web elements in your website are of the highest order. Especially, if you run two or more versions of websites – desktop, mobile and more. Strive to make the user experience seamless and same in all versions. This refers everything from the placement of buttons and links to verifying edge-to-edge text. In any website, the navigation bar and the header are crucial. It can make or break the number of pageviews. Especially, if you are running an e-commerce website, one look at the navigation would give a good idea of the corresponding website. For instance, ensure that the labels, links and topics are placed in a neat row with clear demarcations. The content you put there also matters – most often directly linked to your top line. Ask general users what they feel about pop-ups and the answer is likely that they are irritating, irrelevant or badly coercive. All this gives a bad impression about your website. Keep it to a minimum. Better, you can form a strategy to place a pop-up that is not quite intrusive – for example – placing it at the bottom part of your website. You can hire our programmers, sit with them and work on what all could qualify for pop-up information. Let’s face it – customers and people in general when browsing online do not like to sift through large chunks of monotonous content. Everyone needs a break. As any meticulous programmer would bear in mind, you must pay attention to the structure of your content. Find the right mix of images and content with a fair amount of breaks between every few lines. Visual content also includes the type of fonts, sizes, colors used. The general thumb rule is that end users are likely to stay on your website for a longer time if they find it convenient and worthwhile to read your content. The load times of websites are important indicators of a decent browsing experience. One of the many ways by which webprogrammers can ensure respectable load times – under 3 seconds – is to resize images and compress them well enough to reduce burden on your web server. Tools like TinyPNG can help you with this. Also ensure that you don’t place any text over your images. This will hinder readability and Google’s web crawlers will not be able to detect it. You don’t want to do that if you want to increase your SEO. With this list, hope you got some insights on some common SEO mistakes and how to overcome the same. Are you in search of dedicated programmers to serve your website development / support needs? Get in touch with our programmers here.